All transactions are safe and secure with a reliable history in online purchasing behind each of our associates. 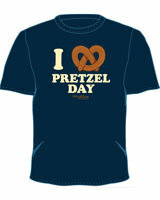 Buy the Office Pretzel Day t-shirt to own Office clothing and merchandise. Let everyone know that you like Pretzel Day as much as Stanley Hudson. Wait in line with this Pretzel Day Dunder Mifflin t-shirt that commemorates the best day of the year, when the office hands out free pretzels. Enjoy the season three episode in your Pretzel Day tee and watch Dwight Schrute, Michael Scott and Stanley Hudson enjoy their doughy snacks at the Scranton branch of the paper factory. Next year Dwight is thinking of charging one Schrutebuck for each pretzel. In addition to the Office Pretzel Day tee above, browse the Office Clothing Gallery for more apparel like men's and women's clothes, kids shirts or hoodies.